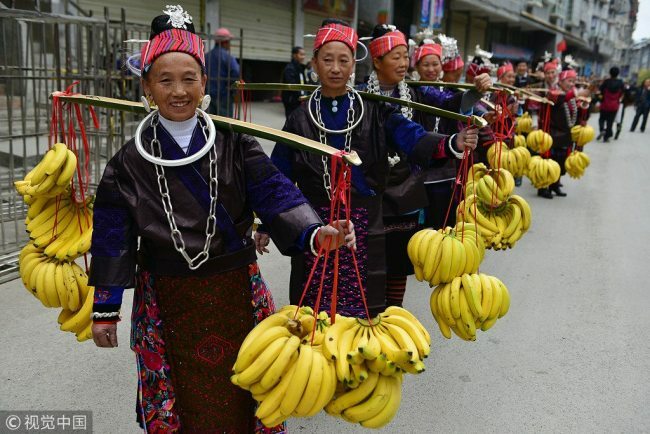 Over 240 women of the Miao ethnic group(苗族) and their husbands, both dressing(穿着) in traditional costumes(传统服装), were seen Wednesday shouldering(肩挑) gifts(礼物) like bananas(香蕉), apples(苹果) and fish(鱼) in Dagaowu Village(大稿午村) of Jianhe(剑河县), Guizhou Province. The couples(夫妇) were going to the homes of their wives' parents to celebrate(庆祝) the traditional(传统的) Miaonian(苗年), a local festival of harvest. It's been a tradition for Miao women to go back home of their parents(回娘家) during the Miaonian Festival(苗年). E.g. Bǎ tā jiào huílái! She looked round in surprise. We can't answer any questions, I'm afraid. I'm unable to make head or tail of it.